Copyright © 2016 Shelagh Lewins. This piece of tablet weaving was inspired by the fringed braid in tablet weave from St Cuthbert's maniple II, which forms part of the relics of St Cuthbert. The original was likely to have been made as a single piece, but I first wove a fringed band, then used a simple two-tablet linking band to sew it to the cloak because this allowed me to work the two new-to-me techniques separately. The weft of the linking band always passes left to right through the shed, then through the cloak and underneath right to left, to wrap the raw edge and fasten the fringed band to the edge of the cloak. The linking band thus performs two functions: it fastens the fringed band to the cloak and binds the raw edge of the cloak. This is a nice alternative to folding and hemming thick wool, or applying a finishing stitch such as blanket stitch with its inevitable suggestion of army surplus blankets. 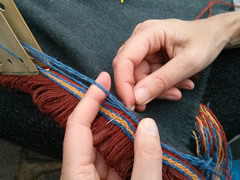 The fringed band is in the general style of early tablet weaving but is not based on any specific find. It is simply woven with twelve tablets. The six border tablets are each threaded with four threads to produce solid borders of blue and red. The six central tablets are each threaded with only two yellow threads in diagonally opposite corners, arranged alternately in pairs and with the central pair offset a quarter turn from the outer pairs, to provide textural variation. A very thin wool for a structural weft, wound onto a shuttle and passed alternately left and right through the shed in the conventional manner. A thicker wool for the fringe. 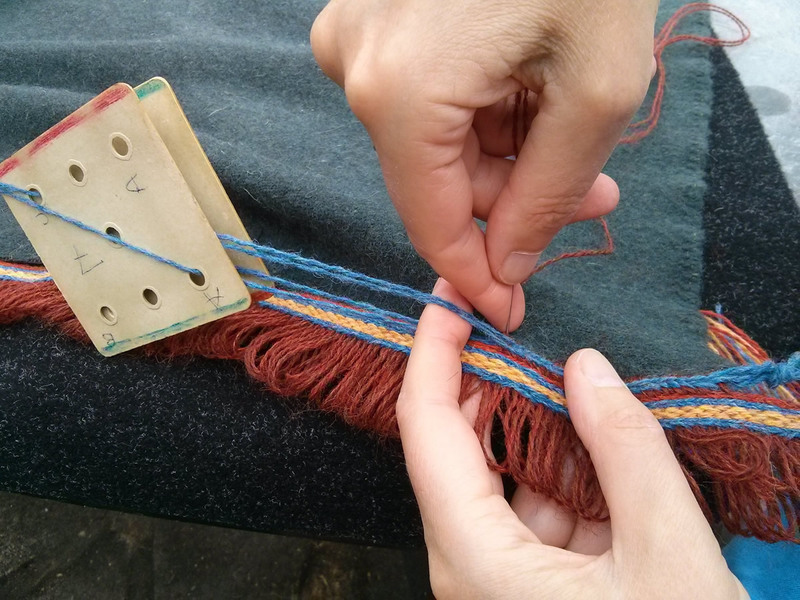 A loop of the fringe weft is pulled through the shed and over a measuring device such as a short ruler, which is held to the side of the band by the weft loops. 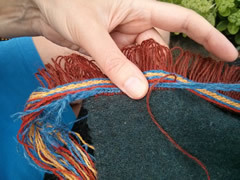 The cone of fringe weft remains on the right hand side of the band, the loop being pulled through from right to left. The ruler can be slid along as the work progresses. For the linking band, I used a 'guilloche' band or plait made with five strands. 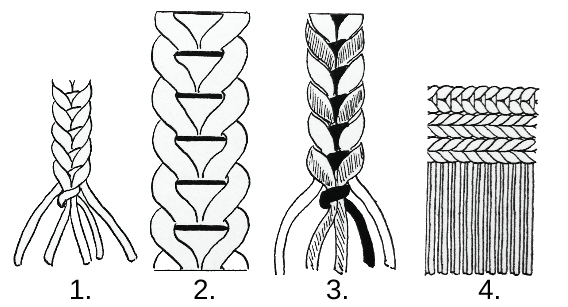 This is made by passing the two outer strands over the inner, then the fifth strand is used as a binding strand. A 'guilloche' is most easily made by using two two-hole tablets threaded right and left, with the weft always thrown in the same direction so it wraps round the warps. Crowfoot describes this type of band in her description of the Relics of St Cuthbert. 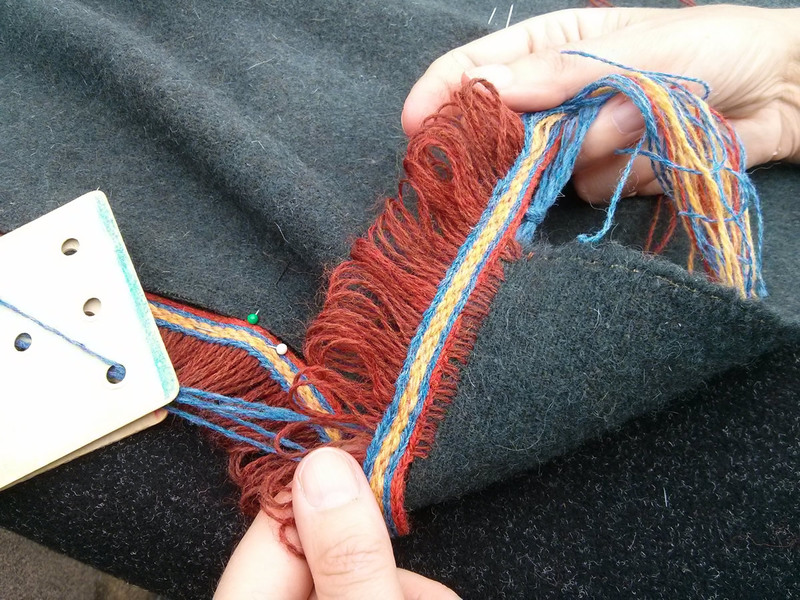 It's sewn to the wrist-bands and also to some of the braids on the stole., and also the borders of the Soumak. Crowfoot writes that this braid is not known from any other finds and was nicknamed 'guilloche' because it looks like the Roman and Byzantine mosaic motifs. As the source material is mid to late Anglo-Saxon, I think this garment is suitable for a moderately high status Anglo-Saxon outfit. I believe a similar technique is known from Norse Greenland and also from Iron Age Finland, but I cannot quote references, so please check this for yourself before using it for Viking re-enactment. 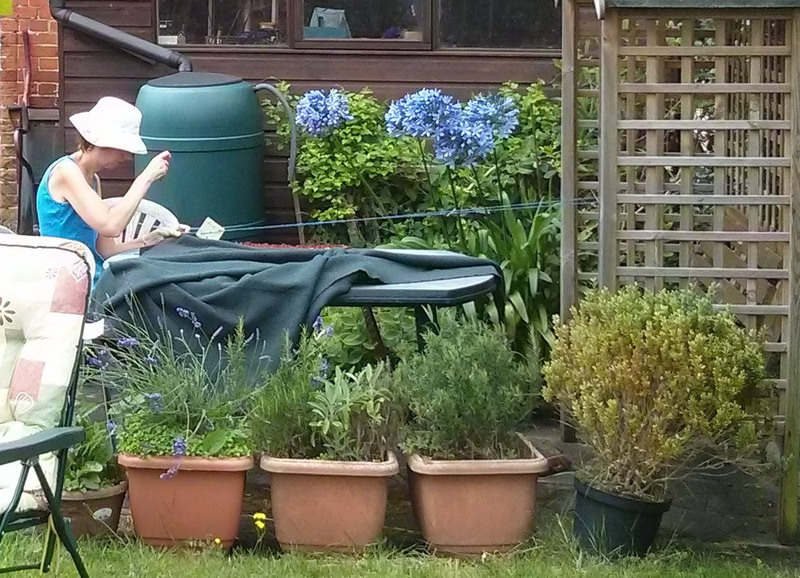 It is a truth universally acknowledged, that garden furniture is at its best when used as weaving equipment. 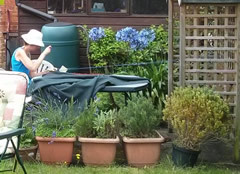 In this case, the trelliswork of our arbour proved ideal as a fixed point from which to stretch my unwoven warp. 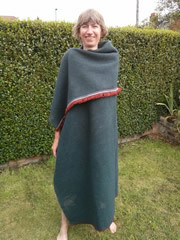 Once I'd woven the first few picks to attach the bands to the cloak, I held the cloak with one hand to tension the warps. I used a relatively short length of weft for the linking band, threaded onto a tapestry needle. At the start of the band I sewed the end of the weft into the cloak as near to the corner as I could, then pulled the thicker blue warp threads tight by hand and started weaving and sewing. As I had expected, getting started was a bit tricky, but it was surprisingly quick once I got into the swing of it. 1. After turning the tablets for the linking band, gently tighten the weft and then insert the needle into the fabric of the cloak about 5mm from the edge..
2. 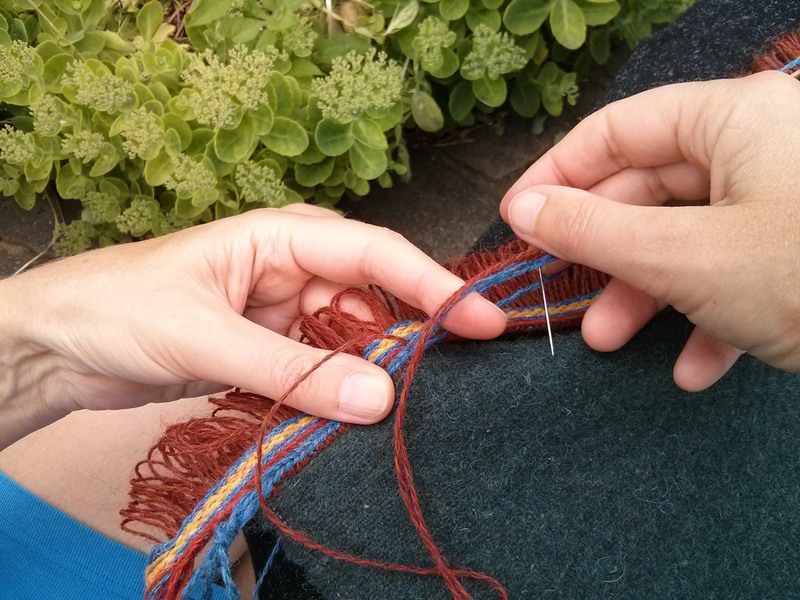 Bring the needle up through the border of the fringed band - it should not go through the cloak again. 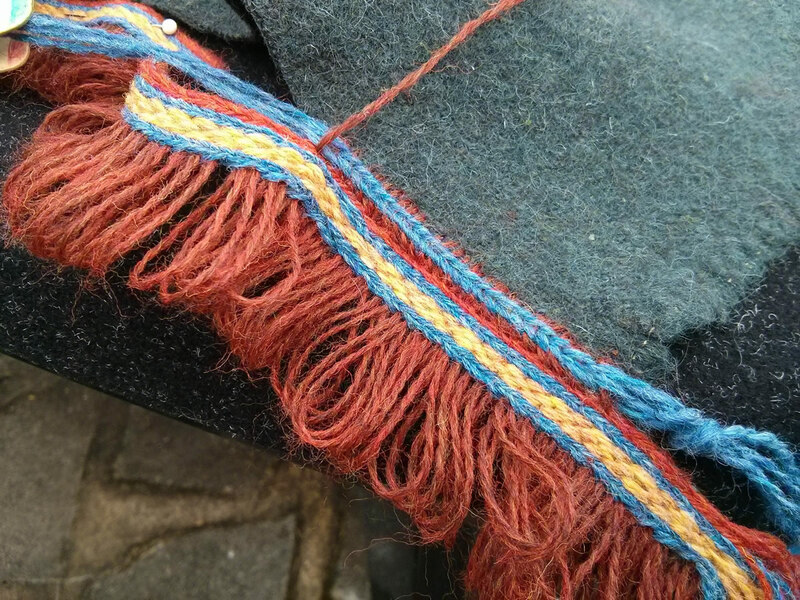 The weft passes underneath the linking band and the edge of the cloak, covering the raw edge on the underside. 3. Again, gently tighten the weft and if necessary, pull gently on the linking band warp threads to 'settle' the band. 4. Pass the weft left to right through the shed of the linking band. Turn the tablets and you are ready to start again with step 1. After weaving about six inches, I realised that the fringed band was curving the edge of the cloak outwards slightly, so I pinned the free end of the fringed band to the trellis as well. I maintained about the same tension on the fringed band and the unwoven warp of the linking band. 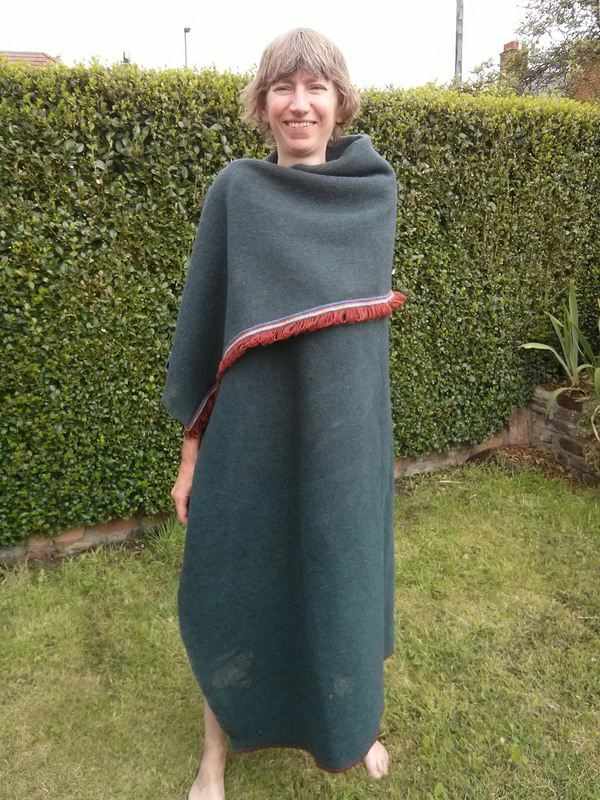 The fabric of the cloak was dense and firm enough that its own weight kept it well enough stretched out: initially I pinned the bands and cloak to a backing cloth but after a bit I found that wasn't necessary. When I ran out of weft, I sewed the end in on the underside of the band and threaded a new piece onto the needle, sewed it firm into the cloak and carried on weaving. When it got dark, I moved the work indoors, using a post clamped to a plank as my fixed point, and continuing to tension the work by hand. The two tablets were fairly easy to keep ordered despite not being firmly tensioned. Bands from the Relics of St Cuthbert, Crowfoot, Grace M., in "The Braids." The Relics of St. Cuthbert, ed. C.F. Battiscombe, pp. 433-463. Oxford: Oxford University Press, 1956.